I. We are getting started with 1x01 on Saturday, January 12, 2013 and a new forum will be opened every following Saturday. Moderators will post following the order in the list above to open threads and we’ll be watching the episodes in sequence. We will then be watching the last episode of Season 1 (1x13) on the week beginning April 6th. II. Every moderator opening a rewatching thread should copy and paste the information in this entry (Introduction, List of moderators, Rules and Master List) at the top. That way, keeping track of the turns and our progress will be easier and also having the rules at hand will be useful for those who may have decided to join us part way through. III. Everyone opening a rewatching thread is responsible for reminding the next person in the list to do the same the following Saturday (sending a pm on Friday should do it). V. People taking part can jump in with comments, but just because you watch and comment on a particular episode does not mean it’s compulsory to watch every single episode to be a part of this rewatching. Here’s a master list of a twelve items we’ll be looking for in all episodes. The moderator will post the lists (as filled in) at her convenience. Anybody can suggest any they see though. Mods will also be posting their own questions for discussion. a. Anything that has to do with Arwen. d. Who spent time in the dungeon? g. Statements about Arthur becoming the great king of legend. h. What Uther says about magic. j. Guest star special characters. l. Knights of the round table appearances. 1. What was the first impression all of you got the moment Lancelot appears on screen? I am asking this because I have the Lancelot of the legend in mind. And he didn't leave a good impression for us to really have good thoughts on him. So, what did you all think when Lancelot appeared? ex: angry, happy, sad ...etc. 2. 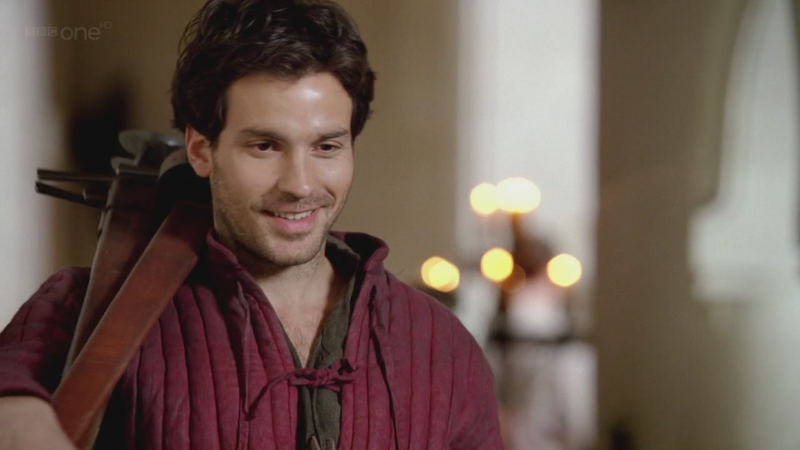 What did you all think of Santiago Cabrera as Lancelot? 3. Compare this Lancelot and the legendary one. 4. Arwen indicator in this episode. 6. Gwen's reaction to Lancelot. Did you all suspect she likes him or was it really a crush thing? 7. That famous line from Merlin, " So, come on. Just for the sake of argument. If you had to, Arthur or Lancelot.". What did you all think of Gwen's answer. 8. Was Merlin's intention noble? Did he do the right thing by cheating? Was there another alternative for him to help Lancelot should he decide not to cheat with the seal? 9. Do you all agree with the First Code? Do you think it will have great consequences in the later episodes should Arthur choose to follow the code? 10. Discuss the relationshipe between Arthur and Lancelot & Merlin and Lancelot compared to the one in the legend. 11. Lancelot is the only one to know about Merlin's powers and that formed a powerful friendship between Merlin and Lancelot. Did you all agree with the decision of the creators to reveal the magic to Lancelot or should it be kept a secret like it was to Arthur? Discuss. 12. In my opinion, Lancelot has respect and better understanding of Merlin because he knows of the latter's secret. Do you think it would have been the same for Arthur should he be let known of the secret too? 13. When Lancelot leaves, did you all expect to see him again or were you all glad to see him leave? 14. Funny moments in the episode. TBH, I wouldn't even have been watching Merlin if they hadn't cast Santiago Cabrera as Lancelot (I already knew and adored him from "Heroes"), so yes, I loved this episode. I was always more interested in the dynamics of the Lancelot-Merlin relationship than that of Lancelot-Gwen, so I suppose this was probably my favourite of all the episodes to feature Lancelot, although I also love "The Darkest Hour, Part 1", which also highlights the strength of the Lancelot-Merlin bond. I think it was a great idea to have Lancelot as the one friend of Merlin's (apart from Gaius of course) who knew Merlin's secret. It's just a great shame that Lancelot was such an underused character, TPTB could have kept him in the story and developed his relationships with Merlin, Arthur and his fellow knights without threatening the Arthur-Gwen romance, IMHO. Ok. #13 even though I haven't watched. I was glad to see him leave but I knew as sure as anything we'd see him again and that he'd be an issue. This is trivia. Am I right that besides Arthur, Lancelot had his name in more episode titles than anyone else. Also, did Merlin's name ever appear in an episode? Allright ... just watched the episode. Will answer all the questions tomorrow. And hope to hear from all you guys as well. I was anxious. First when the name Lancelot was mentioned, I went "dear god" because I hated Lancelot. Mainly because of the infidelity reason. Then I noted Santiago's name and I thought, "They've got to be kidding me" because he was such a nice person in Heroes. So curiousity kicks in and I waited with thumping heart to see how they are going to bring this character into the picture. And when he did, I was relieved and to a certain point in awe of his character. The lancelot in the legend was a total arse but Santiago brought some credentials to the tainted character. Perfect fit fof the character. He brought charisma and nobility to his character. And he is handsome to feast our eyes too. The Santiago Lancelot is a commoner, had a family and wanted to become a knight for a reason related to his family. He admires Arthur, respect Merlin and besotted with Gwen. He is also one who refuses to lie and firmly believes in the code of knighthood which makes us respect and feel for his character even more. Not wanting to deal with his appearnces in the following seasons, I'd say his entrance might have left us reeling but at the end of the day, he gained our respect and sympathy. 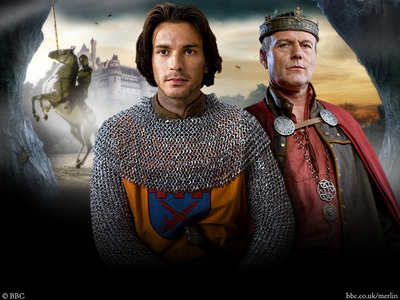 The legendary Lancelot is the son of King Ban of Benwick and Elaine. But as an infant he was carried away by the lady of the lake for which he earns the name of du lac. He is the bravest of all knights and earns the trust of King Arthur only to betray him by eloping with the queen. But since there are many versions of Lancelot, it's quite confusing as to which really describes the character. 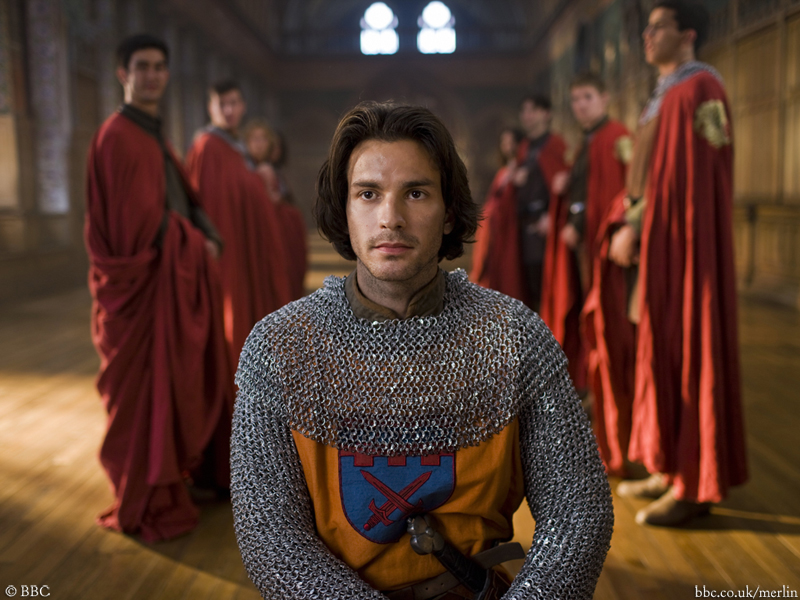 But in all, the legendary Lancelot loves his king and queen, and blames the death of Arthur upon himself. He takes on the life of hermitage and dies six weeks after Guinevere dies. I noted there is one when Arthur is fighting Lancelot for the test. Lancelot swings his sword and Arthur steps away but only inches from the sword. Gwen reaches out and grabs Merlin's shirt in fright. Merlin looks at her, and she apologises, biting her fingers. She is frightened ... for ARTHUR! Merlin not using his powers when the griffin is attacking him. Gwen not writing down the measurements when she is measuring up Lancelot; unless her memory is really good. Guards of Camelot not realising Lancelot is passing them when he is still the prisoner. 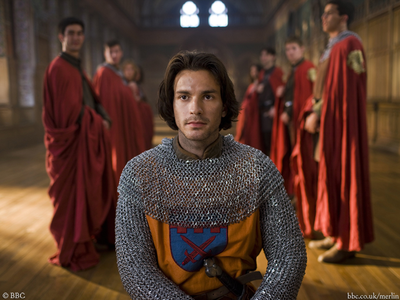 Only Arthur knows he has released Lancelot so ... Well, speaking of the guards, they've been sleeping all five seasons. I think it was crush. Seriously, it didn't look like they were both seriously involved. Yup. His intention is noble. He wouldn't have cheated if it wasn't for the code. That code stopped him from being honest and that's why he opted the cheat. But he wanted Lancelot to be a knight and therefore in my eye, cheating was not wrong indeed. It was a stupid code. Arthur was right not to follow it and it did him justice. He found braver knights in the form of gwaine, lancelot, elyan and percival and many other unnamed knight. We knew he didnt like the code in the first scene itself; complaining to merlin that he still haven't found the right knight because he was given rubbish. And when he defends Lancelot, we knew he didnt approve of the code. Thankfully, he had his own view on the knights. -- The first episode with him I saw was 2x4 so I hated him! And then I watched this one, after many deliberately delayed times, and my opinion didn't really change. I didn't see him as a strong chracter. He was so confused and that wasn't the image of Lancelot I had in mind. -- I think he was good.. I mean, he's fine actor. I didn't like him back then but at the end ( season four) he got better. -- I am not a big fan of Lancelot in the legends and I don't think I've ever read anything about him so i can't really say. But i think the legendary one would fight for Guinevere and wouldn't just leave. --Again Shu answered this one! -- Well she was a servant and Morgana always got all the attention ( not talking about Arthur but men in general), so when a stranger comes by and says sweet things it's naturally to have a momentarily crush. But nothing more, as he didn't stick around to anything more than that to happen. -- First of all, that was no answer!! Secondly, I liked it. I mean, she could totally say Lancelot, as he is the only real option. Arthur was none at that time. And still she didn't chose him. I think that says a lot about her "crush"! -- I am not a fan of cheating and I never support it. However, I do understand that the law is wrong but I don't think cheating is a way to fight it. And I think that was proved in this episode. His intentions were noble, but not necessarily right. -- Definitely and I agree with what Shu said about it, so I do not want to repeat her. -- Again, i cannot really discus it as I haven't read many legends. But Arthur and Lancelot were supposed to be best friends and these two clearly have never been that. I don't see how. Lancelot was never a man who would fight for his love. he simply let it go and I hated him for that. But still he had feelings and they were clear as a day. So i do not think they could have been best friends with that matter unsolved. Merlin and Lancelot are a completely opposite thing. I liked their friendship, but I always perfered the one Merlin had with Gwaine. The only thing I like and disliked is that Lancelot knew about his magic. That's next question! -- I believe they were that close only because Lancelot knew. And he knew beacuse he saw it not because Merlin told him. And that makes a huge difference. So I liked that he knew it, cause someone had to ( I only wish it was arthur or at least Gwaine) and that gave Merlin a chance to be himself and that was really nice to see. I disliked it because of the reasons I stated before: he found out on his own and he wasn't even friends with Merlin at that time. Not that good at least. -- I do not know. I don't think Arthur was prepared in season 1 to find that. Maybe not even in season 2. But since season 3 he was showing making of a great king and I think Merlin should had told him! He would understand, eventually.... I always wanted to see that progress..
-- I'll leave this one to you! In this episode, the few brief scenes these two has clearly bore some resemblances of the legend. Because in the legend, Lancelot was Arthur's most trusted knight, friend, confidante etc. And Lancelot was also Arthur's best fighter. And in this episode, Arthur trusts and is good friend of Lancelot. I just wish they have expanded this friendship rather than opting to focus on the betrayal part. This friendship is new. And it's refreshing because it was something unexpected. In the legends, Merlin was closely associated with Arthur. SO this new take was nice and fun to watch. And i really like this friendship because it allows Merlin to confide and share his secrets. I prefer Merlin sharing his secrets with someone else apart from Gaius and it's nice to know that person is Lancelot. In season 1 & 2, it was still early for Merlin to share it with Arthur but i prefered him sharing it with Arthur in season 3 or 4. But we all know how they screwed up, don't we? Lancelot knew Merlin's secret early on and wasn't lied to. He has respect for Merlin because of the secrets they both share. Whereas for Arthur, Merlin hid the truth from the prince and Arthur hates being lied to. And he'd been keping the secret hidden even after Arthur becomes the king. So if Arthur was let known of the secret in season 1, he would be following Uther's orders and execute Merlin because he is still a prince. In season 2 & 3, Arthur might have been tolerable but wouldn't have forgiven Merlin. In season 4, he would have been hasty in his decision but perhaps with Gwen by his side, might have pardoned Merlin. And season 5, he would have learned to accept magic and merlin. I knew there was more because he is freaking LANCELOT! Not many worth mentioning. Maybe next episode will have more. 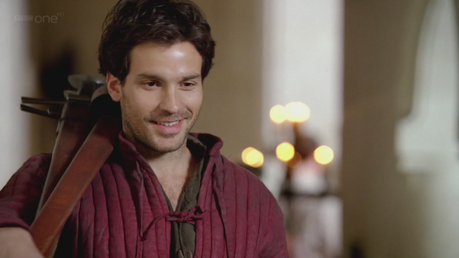 1.What was the first impression all of you got the moment Lancelot appears on screen? I am asking this because I have the Lancelot of the legend in mind. And he didn't leave a good impression for us to really have good thoughts on him. So, what did you all think when Lancelot appeared? ex: angry, happy, sad ...etc. Nothing much, he did not appeal to me in anyway. I had no expectations. His story about why he wanted to be a knight was okay, but what impressed me was his fighting for Arthur with or without being a knight and then the end leaving because he caused friction between Arthur and Uthur he took responsibility for his action. The whole interaction between Merlin and Gwen at the celebration; about Gwen choosing between Arthur and Lancelot was a subtle hint. I missed the Gwen worried about Arthur, good eye Shu. Merlin uses magic left and for other people and when he’s alone in the forest and he’s attacked; he doesn’t even try to save himself. Wings and heads of an eagle, body of a lion and Uther does not think it’s a magical creature. Isn’t kind of strange Gwen hanging out at the knight’s training section; just saying. She seems to not really pay that much attention to him at first, just I doing a favor for Merlin thing. But the more he gave her attention and his actions stirred up some feelings. A crush and I wouldn’t mind getting to know you better. It’s not like Arthur or Merlin was showing her any attention. However, I don’t think it was serious. I think this was another miss direct. Just like episode 1’s who would want to marry Arthur. Merlin comment that Gwen would not know her type if he was standing right next to her; a reminder of her crush on Merlin so we don’t know which way the romance is going. I believe Merlin’s intentions are always noble. He truly wants to help people. Is it right to cheat, I can’t agree with it, but then the show would have been over quickly. It was a good plot tool. No, I do not agree with the First Code. It would if Arthur was that type of man, but he is not. 10. Discuss the relationship between Arthur and Lancelot & Merlin and Lancelot compared to the one in the legend. I liked that Merlin could talk with someone other than Gaius. I would have liked Gwaine to know too. Of all the knights Lancelot and/or Gwaine was the best choice. I don’t think it knowing Merlin had magic created the bond. Gwaine and Merlin had a powerful bond as well and he didn’t know about Merlin’s magic. I would want Merlin as friend with or without his magic. Magic is a part of Merlin, but it did not make him who he was. Arthur got to see the man that yield the power. Having magic did not make Merlin special, his heart and soul made him who he was. In the end Arthur respected the man. Yes, I expected him to see him again. I was not happy about it, but I did expect him to return and be an issue for Arthur and Gwen. Yes, I was glad to see him leave. Okay here are my answers guys! I thought he was brave to step in and save someone he didn't know. I was intrigued to find out how they would portray Lancelot knowing vaguely what happens in the legends. I wondered how they would show his relationship with Arthur and Gwen. To be honest, I know a lot of people like Santiago, but I found his performance to be lacking. I tried to feel something towards his character after hearing his back-story, but Santiago didn't sell it to me. So for me I could form an sort of affection for his character, not because of the role he would play in the triangle, but because he couldn't sell it to me. I'll be honest when I first heard about this series I didn't know much other than Lancelot has an affair with Guinevere. I had only seen The First Knight and King Arthur and I sort of liked Lancelot in those movies (I admit I even shipped him with Guinevere, which I very much regret now. Totally an Arwen shipper for life now). We definitely see that Lancelot is attracted to Gwen in this episode and has a respect for Arthur which he does in the legends. Well obviously Merlin asking Gwen who she would choose if she had a choice was a huge indicator in this episode and it was an interesting one. Mainly, because at this stage Gwen still has a crush on Merlin, sees that Lancelot is paying her attention and doesn't think of Arthur in any way at the moment. The moment that Shu mentions about Gwen grabbing Merlin's shirt and though people thought she was frightened for Lancelot, it was Arthur. Well I'm not sure whether it is to be honest. I think its possible that she is frightened for them both. At that stage anyway. Shu mentioned some great ones, but the one that stood out to me was the fact that when Merlin was forging the seal that he didn't think they would check the records to see if the Lord was-was-his-name had a fifth son. That was a huge one for me because Merlin knows how Uther is when it comes to the first code of the knights. I think what Gwen felt at that stage was an attraction for sure. More like a crush type of thing. She respects the person that Lancelot is, however, when Merlin mentions that Lancelot fancies her she fobs it off and says that he isn't her type. This line I found to be very interesting, because it could mean a few things. First, that she is either pretending that Lancelot doesn't have feelings for her, and secondly, that she doesn't consider herself one to capture someone like Lancelot's attention. Before, Lancelot goes to face the Griffin, Gwen tells him not to go. This I take as something she would say to anyone she cares for. However, there is an under-currant of Gwen wanting Lancelot to stay because she has some type of feelings for him. I addressed this above, but I think that for Gwen she never considered herself a girl to capture a man's heart. You see the way Gwen looks up to Morgana and you can tell that she doesn't see herself as a woman that would have men falling head over heals in love with her. So that is why I believe she said what she said because at that stage she didn't know that she would have not only Lancelot, but the future King of Camelot fighting for her love. Merlin definitely had good intentions in wanting to return the flavor to Lancelot and he saw Lancelot's potential to be a great, noble knight. However, he definitely had quite a few flaws in his plan to be honest. And his thinking too. He said that they would see Lancelot as a great knight, based on his ability and not whether his was noble, yet he forged papers for Lancelot so Arthur and others thought he was noble. It's hard to know whether Merlin could have gone another way about it because at this stage would Arthur have been willing to test Lancelot if he knew that he was a commoner. Obviously we know down the track what Arthur thinks about the first code (we see hints of this in this episode), but I do wonder what Merlin could have done. It's a tough situation. No, I don't agree with it at all. Some noble people can turn out to not actually be noble on the inside. As to the consequences, we do definitely see that Arthur doesn't not agree with it and thinks it is wrong and this is something that we see Arthur struggle with for times to come. 10. Discuss the relationships between Arthur and Lancelot & Merlin and Lancelot compared to the one in the legend. Well, like I said above, I don't have much knowledge on the legends (mainly I know stuff about A/G), but I did like the way Arthur and Lancelot, as well as Lancelot and Merlin's growing affection and friendship between each other. It was great to watch. Well, it was by accident that Lancelot learnt of it, Merlin didn't think Lancelot was that observant to figure it out. It definitely was a part of the reason that Merlin and Lancelot formed a great bond, but it is annoying that Lancelot figured it out, but Arthur didn't. For me, I don't mind the idea of someone else knowing about Merlin's magic, but it would have been nice if it was a actual member of the cast, nit a recurring character. For sure I think Arthur would have seen that Merlin is smarter and talented than he gives him credit for. Magic is a huge part of Merlin and Arthur never knew that so I do think that Arthur would have had a better understanding of Merlin. However, that being said, the situation is delicate. Magic is banned and Arthur is Uther's son and as been taught since birth that all magic is evil. So I understand that at the beginning Merlin was hesitant to reveal his secret to Arthur, but later on, my views on this changed. I knew that Lancelot would return and I was not really excited for it to be honest. Ummm... I found the effects of the bird quite funny. You can tell they didn't have a huge budget for the CGI in series 1. There weren't really funny moments in this episode to be honest. There were amusing moments, like when Lancelot and Merlin wake up hung over and Gaius gives them something to perk them up.